Baby's Journey Home: God is Faithful! Sunday morning we talked to the surgeon for the updates of the past 24 hours and things look positive. He said the x-rays of his lungs today improved again and there is still no bleeding. He continued to say we need another week of rest with no set backs. I said we just need a day at a time. Today has been another day of rest for Baby Todd just like he needs. God is faithful and answered our prayers once again! Jerri's sister Sharon was able to bring the girls down to see us today. We got to show them around the hospital and the room where we are staying. The train wall in this picture is the hallway of the hospital. The hospital is geared for children and every hallway has a different theme. The patient care provider gave a bag of hospital suppies to the girls. 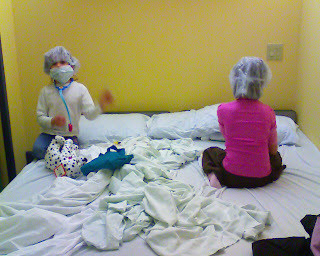 They had a wonderful time playing nurse in our room on baby Todd's stuffed animals. 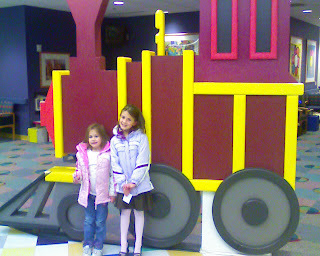 We also took the girls to Chuck E Cheese's and had a blast. We were quickly remided of the energy level our girls can have. Tonight we pray for another day of rest for Baby Todd and for the Holy Spirit to breath complete healing into his lungs. We need to remain faithful to God and his Power! Thank You to All and Praise be to God! What great pictures! It's nice your girls were able to come and that you guys could have some quality family time. So glad that today was another restful day. We will continue to pray for rest and healing, especially for Todd's lungs. Blessings! I'm so glad Sharon could do that for you and the girls. I think of the disruption in their lives too with parents needing to be away. But you're doing a good job keeping connections with them in spite of the emotional roller-coaster you've been on in Delaware. ITs so good to hear of God's healing. I can't say enough that God is an awesome God. Thanking him for answering prayer and continuing to heal Todd and give him restful days. Take it one day at a time. So glad to see the girls could come down and you could spend some much needed time with them. Yeah! Another day of rest. We are thrilled to hear that he is continuing to do well. I'm glad you had fun at Chuck E. Cheese with the girls--that place has a way of making kids energetic!! You are in our thoughts & prayers all the time.